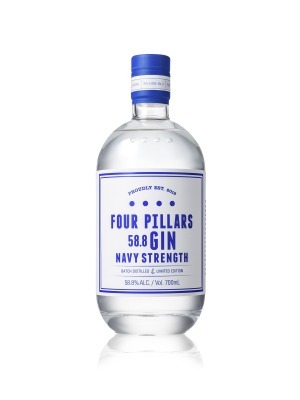 Four Pillars Navy Strength Gin is a popular Craft Gin available from Amazon.co.uk in 70cl to buy online. Visit Amazon.co.uk for the best price for 70cl of Four Pillars Navy Strength Gin or compare prices on our other Craft Gin products. The addition of finger limes and fresh ginger during the distillation process highlight Asian spices like coriander and star anise. Finally, fresh turmeric adds a fresh but earthy quality, not unlike dill, and weight to the palate. The resulting gin has lifted aromatics of lime curd, pine needles and fragrant spices with a vanilla character which pulls the spices together. The palate is intense - sweet and juicy - but it is still very clean. Where to buy Four Pillars Navy Strength Gin ? Four Pillars Navy Strength Gin Supermarkets & Stockists. You can buy Four Pillars Navy Strength Gin online in most retailers and find it in the Craft Gin aisle in supermarkets but we found the best deals online for Four Pillars Navy Strength Gin in Amazon.co.uk, TheDrinkShop, DrinkSupermarket.com, and others. Compare the current price of Four Pillars Navy Strength Gin in 70cl size in the table of offers below. Simply click on the button to order Four Pillars Navy Strength Gin online now.